First off, I’m happy to say isn’t just a hypothetical situation I wrote up for this comic. 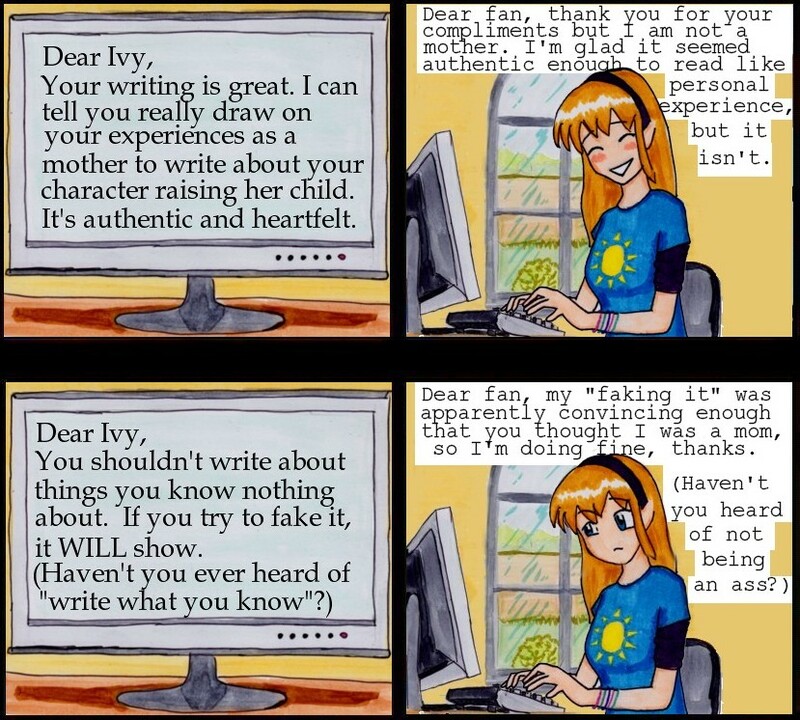 (In case you’re curious, I ended up signing with the agent who asked me to cut 30,000 words out of my book–the situation from this previous comic.) 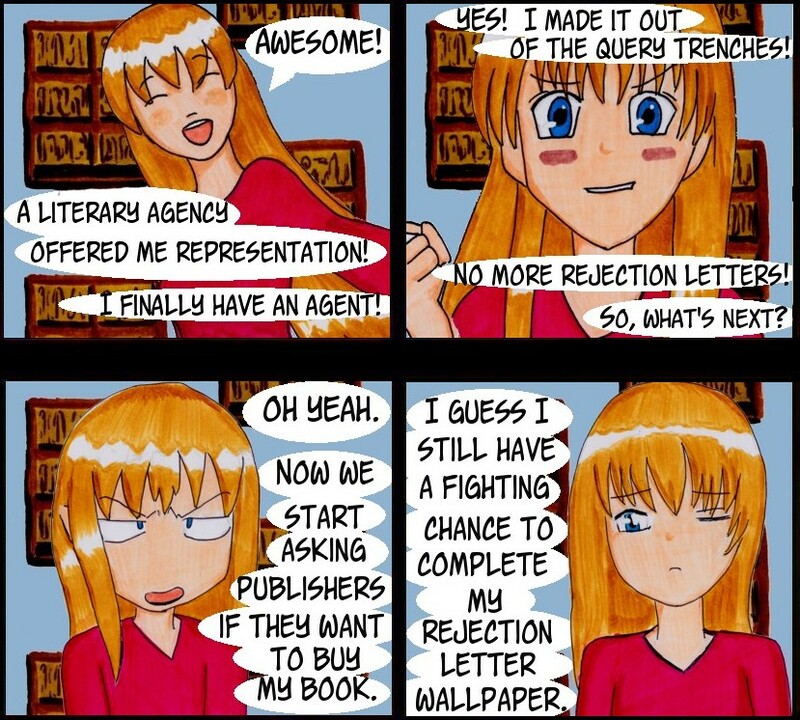 Getting representation feels like a giant step forward–and I’m hoping it is!–but once you’re out of the query trenches, it’s not like you’re home free. . . . So now that I no longer have to query agents to ask if they want to represent my novel, my agent gets to start querying publishers to see if they want to take a look at my book. And the cycle begins again. I’m glad to say my agent seems confident that publishers are going to fight over me, but I’m far too jaded to expect it to be easy. . . . But who knows. Maybe soon I’ll be doing comics about bashing my head in over line edits from the publishers and stressing over cover concepts and sequels and movie deals, huh? We’re swinging for a three-book deal for my fantasy trilogy starting I guess this week, so wish me luck! Happily I’ve never had a person actually turn around and tell me I’m not capable of doing something I’ve clearly just done, but I’ve heard this “write what you know” nonsense both ways. If I did it awesomely, it must be MY experience I’m writing! And if I haven’t had this experience, there’s no way I could write it well! Right? News flash: Figuring out how to speak and think as a different person—to present perspectives and experiences that are not our own—is pretty much WHAT WRITERS DO. Unless we are writing our autobiographies, the things we write about can’t be assumed to be representative of what we think and what we know, and we can’t be expected to restrict our writing to presenting only points of view or experiences that are copied verbatim from our own heads.